Weird patent file #48295: RIM (makers of BlackBerry) has a plan for a billboard that changes the ad’s length depending on speed. The slower you drive, the more time you have to read (and crash! ), so the longer the ad will be. Tech companies file patents for all sorts of reasons. Sometimes they’re already discarded ideas that the company would rather other companies not use. Sometimes they’re for a potentially valuable concept. Sometimes they’re for crazy or impractical ideas that will never see the light of day. And then there’s this odd little filing from RIM, the company behind BlackBerry smartphones. 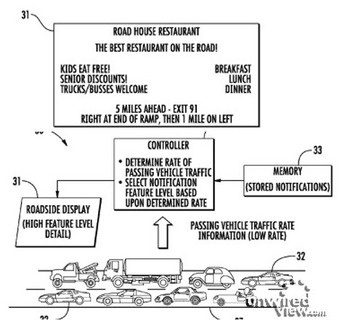 RIM filed for a patent for this “adaptive roadside billboard system and related methods.” Essentially, the patent is for a smart billboard that measures the speed of passersby and adjusts its content accordingly–but the only adjustment mentioned specifically is length. Recklessly speed by one of these billboards at 95 miles per hour, and you’ll see a particularly brusque message–something like “Buy BlackBerry!”. But if you’re stuck in a traffic jam in front of said billboard, you’d get lots more information. Maybe you’d see a full spec sheet and pricing details for the new BlackBerry Torch, or a more detailed comparison with a competing handset. RIM doesn’t lay out one essential way to measure the speed of passing cars, mentioning several possible options. The most obvious, in terms of compatibility with RIM’s core business, is the use of a smartphone’s GPS. But it’s not clear how much more effective that would be than a more traditional light sensor. Also of note is that the billboard itself won’t necessarily just be for RIM products. The sample artwork depicts a restaurant, which suggests that if RIM were to actually go ahead and create this billboard tech, it would license it out to other companies. But even if it’s just an idea a RIM engineer thought up, it was one that RIM thought best to own outright–even if it never achieves a BlackBerry-like ripeness.